The Lois Lane from the New 52 may be dead, but she is far from forgotten in the latest issue of Superwoman. Lana Lang now has to deal with her ghost, or at least that is how it seems. 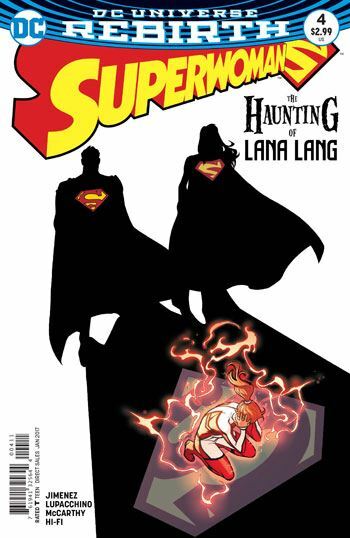 It’s funny, looking at these past four issues, in which Lana Lang has gained powers, had her life turned upside down, started lying to her boyfriend, and is now being haunted, becoming a super hero has not turned out very well for her. On the other hand, it has been a treat for me as a reader, and I must assume for others as well. Jimenez really allows the reader inside Lana Lang’s mind. The fears she has, as well as the hope. The conversations he scripts are beautifully layered, entertaining and yet neatly building an increasingly dark situation. Heck, he has even made Lex Luthor a somewhat sympathetic character in this strip, thanks largely to the machinations of his sister, in her new Ultrawoman identity. Jimenez also brings back Traci 13 in this issue, a character ignored in the New 52, despite having a prominent role in Flashpoint. Traci and Natasha Irons pick up their old friendship as if no reality altering events had been taking place. Enjoyable as always, and every issue goes in a direction I didn’t expect. Jimenez just keeps hitting the ball out of the park with this title.